Bundled in their hats, scarves, and mittens, PreK students at St. James Academy huddled around a microphone in the school’s television studio. A few kiddos were jittery. Some were giggling. Some were nervous. After all, this was a big moment for the class of 22 four-year-olds. They had been practicing for weeks and were now ready to lead the entire PreK – 8 Grade School in the morning prayer, Honor Code, and Pledge of Allegiance. Live on the school’s video morning announcements. They concluded their morning “television debut” with a song on a how to build a snowman. So, of course, scarves and hats were necessary. Outside the studio door was a crowded hallway of proud parents, teachers, administrators, and lower school students waiting for the chance to high-five and congratulate the PreK class. But no one was more proud than their teachers, Megan Anecharico and Courtney Fox. Experiential learning is a hallmark of the new PreK program at St. James, which launched this past fall. 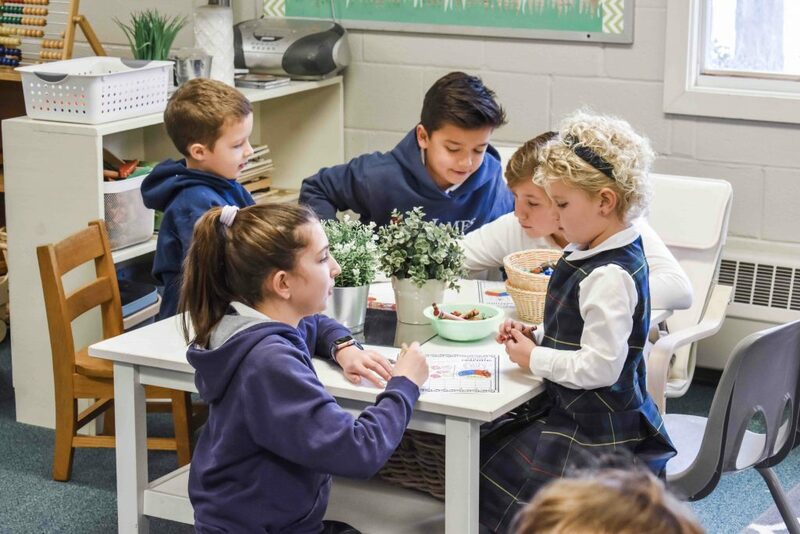 As an integrated part of St. James’ PreK-8 Grade campus in Monkton, the PreK program has the opportunity to utilize facilities other programs can’t readily access. PreK students at St. James aren’t just learning their 123s, playing on the playground, and enjoying circle time. They’re engaging in real-life experiences. Learning French and Spanish. Designing their own pottery in the art room. Experimenting with circuitry in the Maker Space. Climbing on the rock wall in the gym. Exploring the the library under the guidance of a full-time librarian. What does that exposure lead to? Learner confidence. 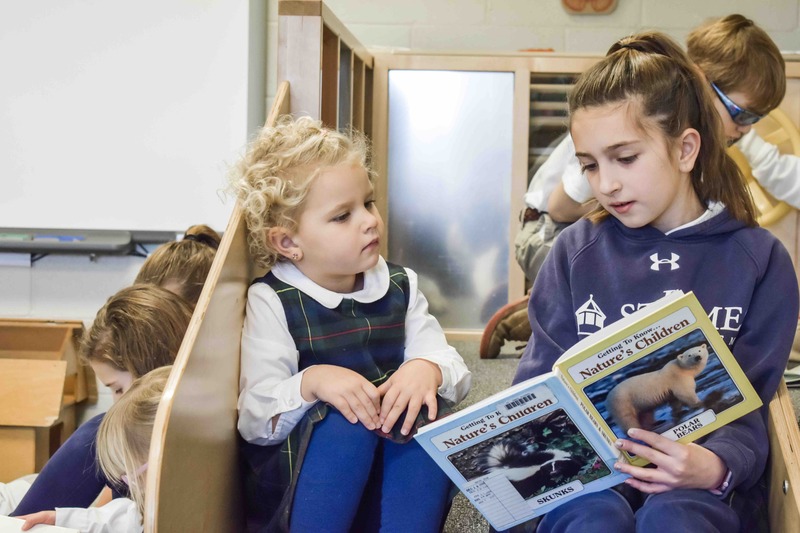 “We decided to add the the PreK program in order to enhance the excellence of what will follow in our Kindergarten – Grade 8 program, It is the first step in a 10 year journey of growth and learning” said Lori Dembo, Head of Lower School. 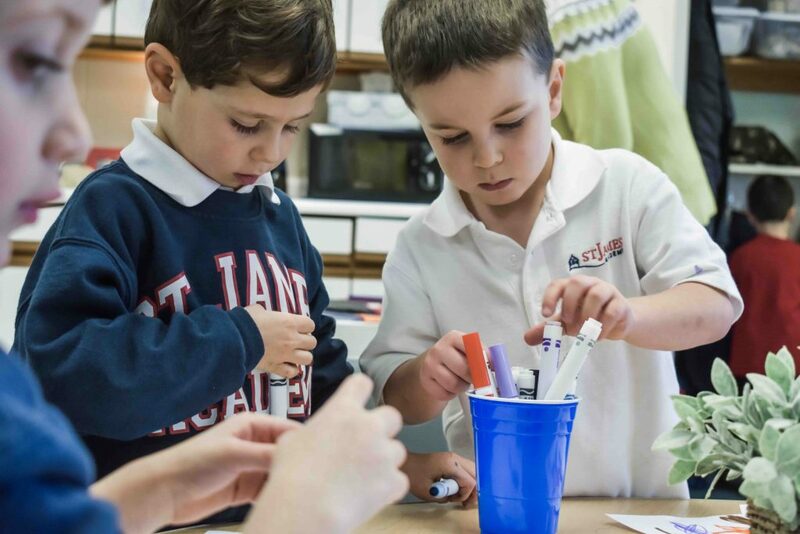 St. James’ PreK program was designed based on the Reggio-Emilia philosophy, a child-centered educational approach that embraces open-ended questioning, project-based learning, and lots of movement. Students arrive each morning and begin their day with Morning Exploration. They engage in circle time activities, explore developmentally appropriate Language Arts, Math, Social Studies and Science activities, attend two special area classes, and still have plenty of time for play, rest, self-directed learning, and outdoor discovery. With almost 90 acres of open fields, playing fields, woods, gardens, and playgrounds, there are plenty of opportunities to explore! It’s not just teachers that are guiding student learning. PreK students are learning from their older peers — everything from how to be a supportive co-learner to mentoring through the “Buddies” program. For example, the fourth grade invited PreK to their classroom to show them their simple machine projects. PreK students had a blast catapulting objects through the air and testing out their various machines. 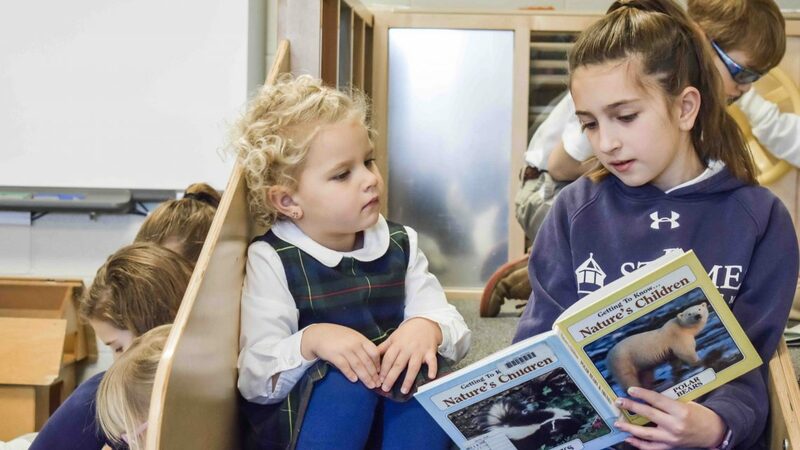 Knowing that all students are not ready for a full-day preschool program (and that parents have varying childcare needs), St. James offers flexible learning options that include full and half-day programs, as well as an aftercare program that runs until 6 PM. Ms. Anecharico echoed the sentiments. Learn more about the program by visiting their website or schedule a tour by contacting Katie Wareheim, Director of Admission & Enrollment Management at (410) 568-7563. Editor’s Note: This article is sponsored by St. James Academy. Photos provided by St. James Academy. Sandi Uehlinger contributed to this article. Next post Reginald F. Lewis Museum Hosts FREE Family Day on Saturday!